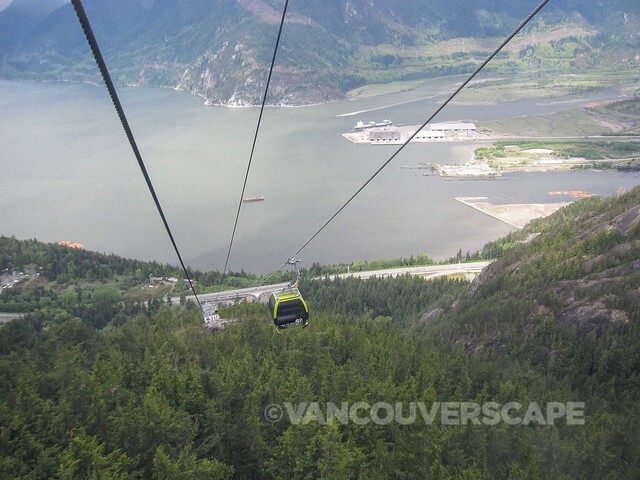 Exploring BC just got a little more exciting with the soon-to-open Sea to Sky Gondola in Squamish. 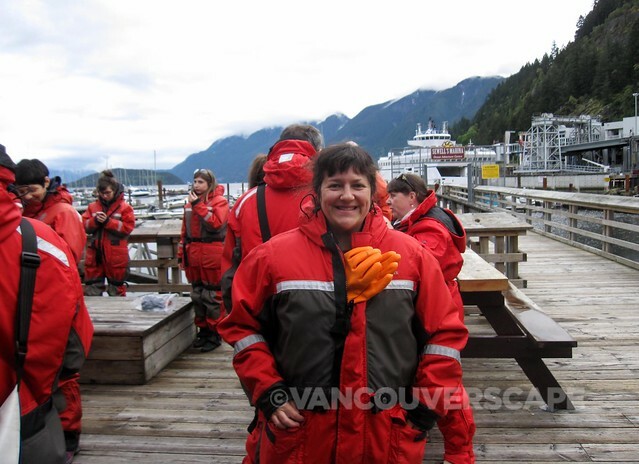 I was invited last Friday on a Landsea Tour of Horseshoe Bay, Squamish, and environs as our media group headed in a minibus from Canada Place to our first destination on the tour, Horseshoe Bay’s Sewell’s Marina. 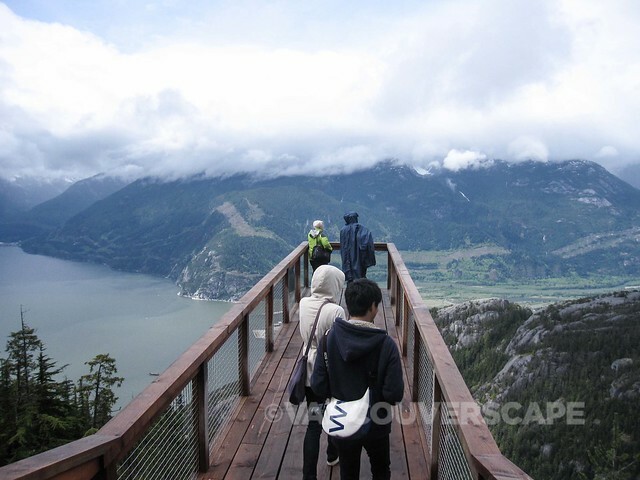 As a local, you might think that Vancouver and Sea to Sky tours are mainly marketed towards our city’s busy cruise ship industry, however many of Landsea Tours are geared towards BC nature and adventure lovers who haven’t necessarily just docked for the day. 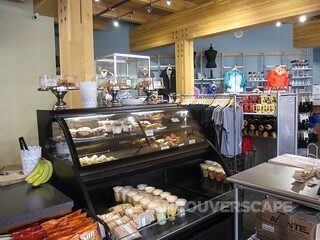 During each tour, information on the region, its history, and points of interest are mentioned along the way. Approaching our first stop, we learned that boats were originally the sole form of transportation to Horseshoe Bay, aka ‘the end of civilization’. Growing opposition against change in Horseshoe Bay eventually gave way to ferry companies settling in, first Black Ball Ferry, later BC Ferries. With the completion of the Upper Levels Highway, people began to bypass the small community altogether. 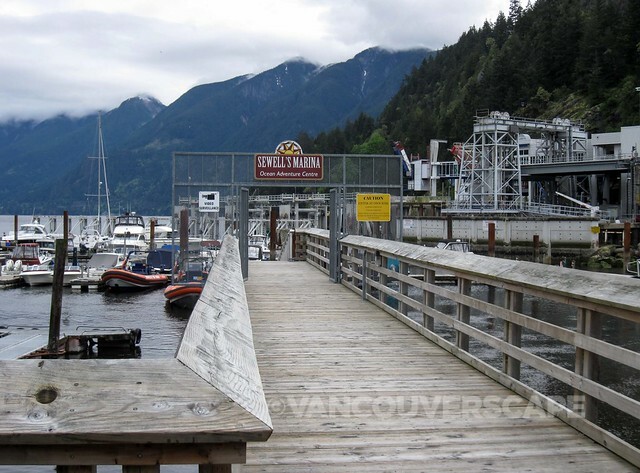 In an ironic twist, the changes Horseshoe Bay feared with the advent of ferry lines is now what keeps it viable to this day. Until the 1950’s, this sleepy seaside resort was home to six boat companies, Sewell’s Marina the only remaining, fourth-generation, family-owned business (since 1931). 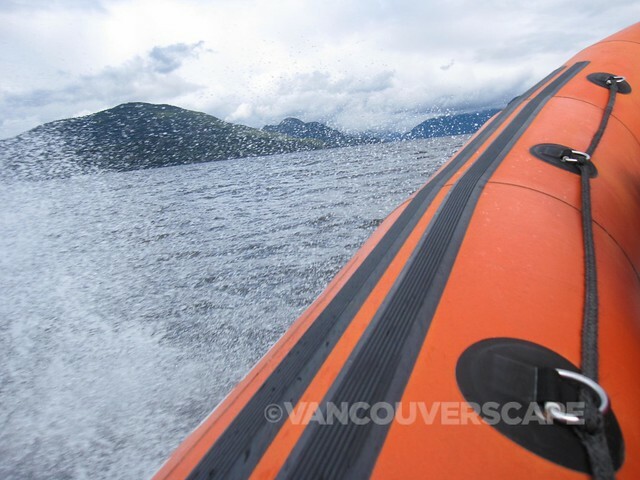 Boats were pricey; vacationers thus rented boats to explore Howe Sound. Post WWII, added labour yielded more boat companies, driving the prices down, while making a pleasure craft purchase easier on the wallet. 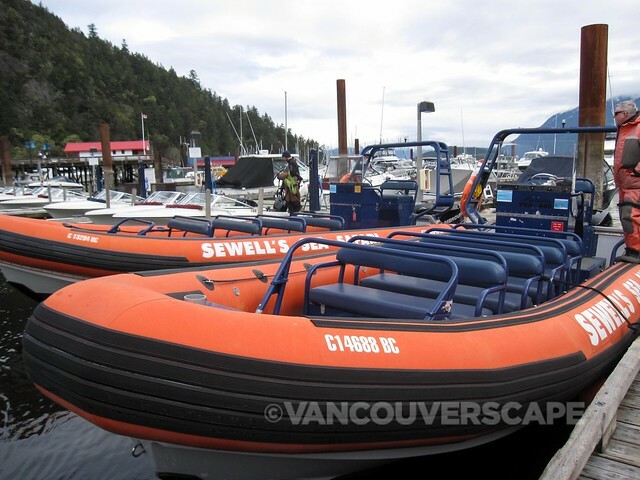 Sewell continues to rent boats for charters, team-building, and other events, however I’d wager that the Zodiac tour would be their most popular option! 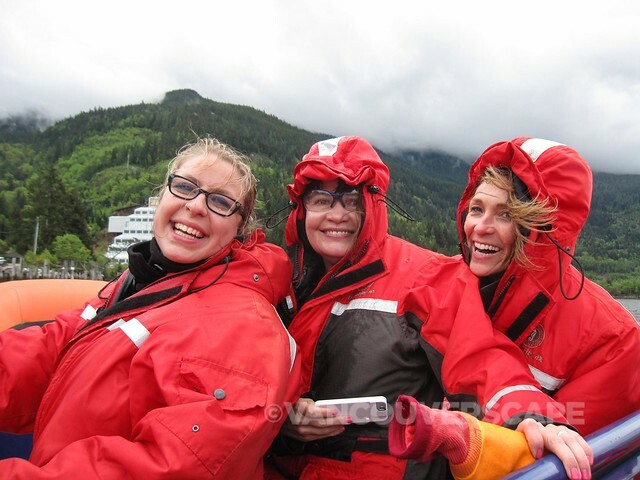 We bundled up into warm coveralls for a eco-tour deep fjord sea safari aboard a Zodiac, an inflatable boat kitted with twin Verado Mercury 4 stroke outboard engines. 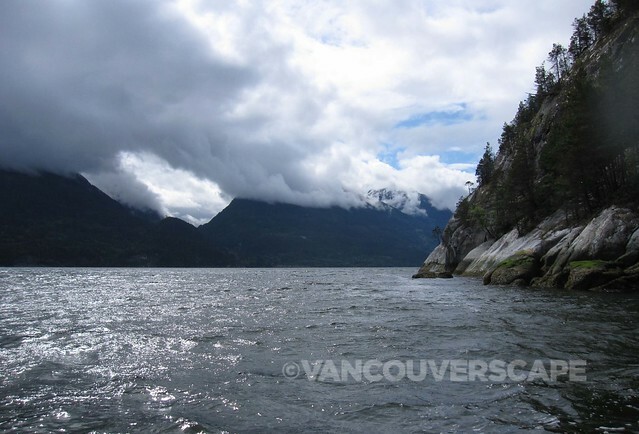 Slowly heading out of Horseshoe Bay, I immediately began to feel a new appreciation for the waters hugging our coastline. Our guide pointed out several key highlights of what we were seeing: local sea life, birds, and small rock formations, including Pam Rocks, containing a weather station to deliver marine reports. 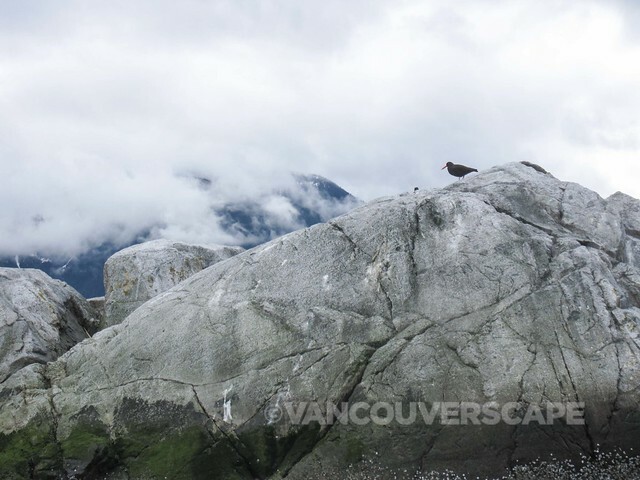 This tiny group of rocks is also a favourite spot for birds and seals. Speaking of birds, our two inflatable boats caught the attention of an enormous flock of Surf Scoters, who instantly flapped their wings in unison, creating a cacophony of sound on the water. It was a brilliant moment to watch, one too quick for me to grab my camera’s video feature for, but shown below in ‘still’ mode. 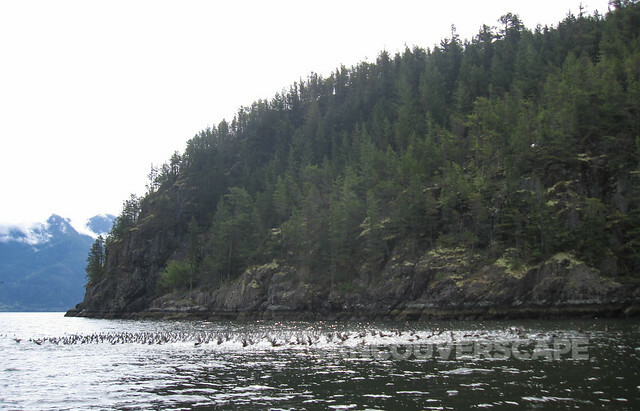 The large sea ducks circled our two boats, later moving on likely in search of nourishment from the rich marine life below. Our crew found moments to gain momentum, making for an exhilarating, sea-splashed frenzy, especially for those brave enough to sit in the front row. This is definitely a wicked fun way to enjoy nature. 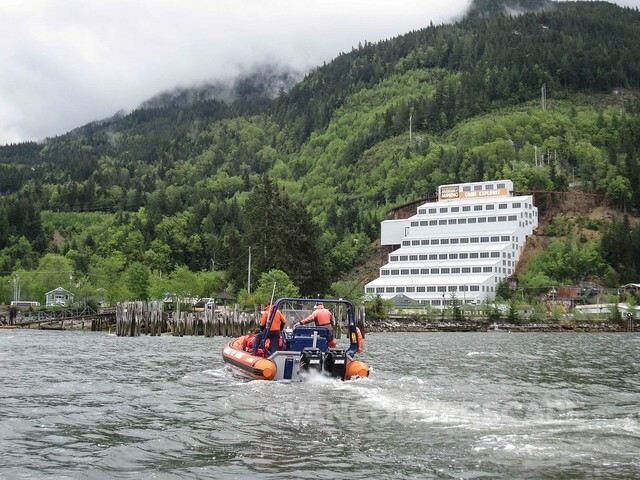 Before long, our boats were closing in on Britannia Beach with recognizable BC Mining Museum in the distance, where the wet and wild portion of the tour ended all too quickly. The Sea Safari season runs from April to October, with four departures daily. Visit the website for updated information. 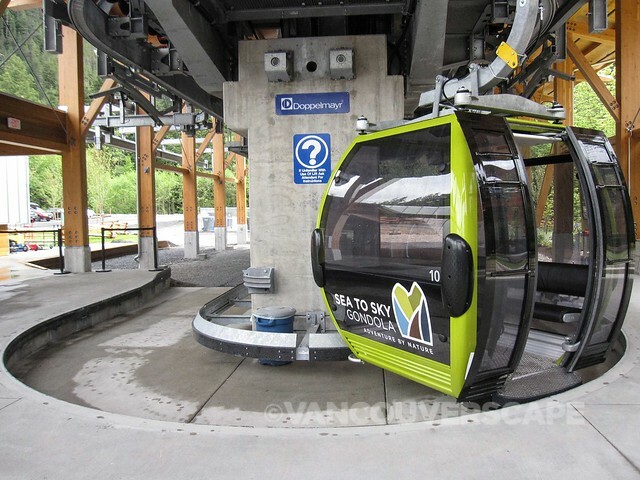 Back on the bus, we were on our way to experience the Sea to Sky Gondola, opening to the public this Friday. 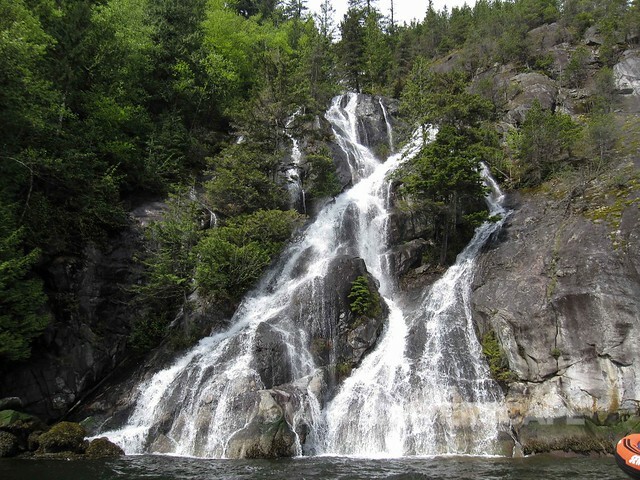 We passed Shannon Falls (formerly Shannon Creek), the third-highest waterfall in BC. 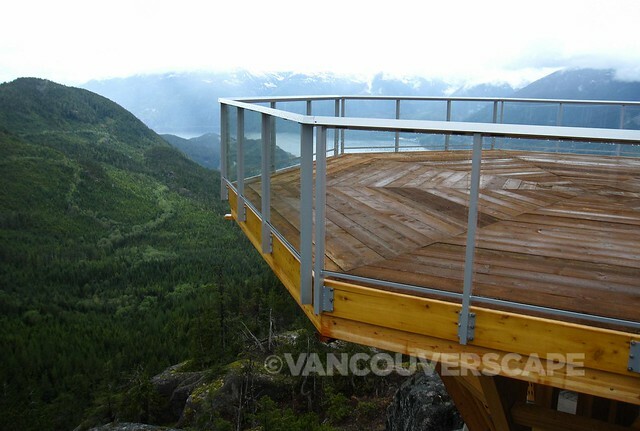 Fancy a spectacular view 887 meters high above Howe Sound? Now’s your chance. 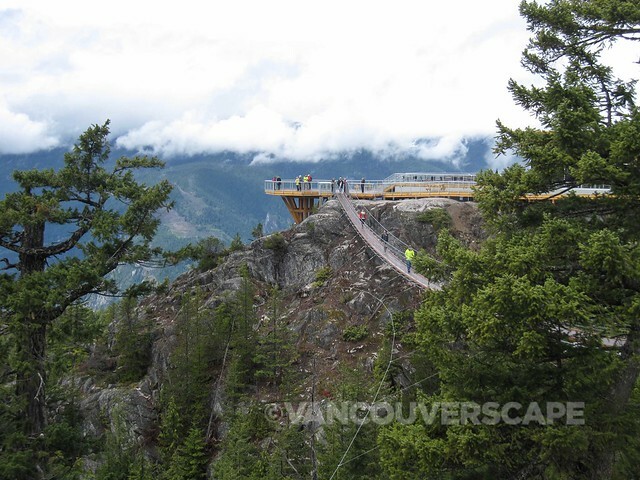 Squamish’s latest attraction was built to the tune of $22 million, and will open up a wealth of exploration opportunities year-round in a town considered the Outdoor Recreation Capital of Canada. 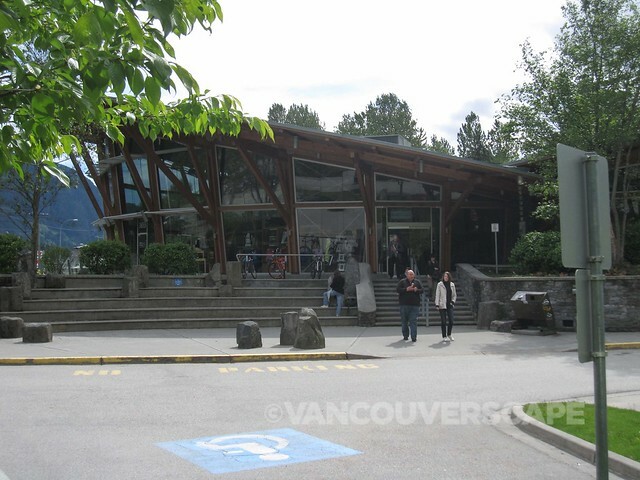 The gondola is located between the Stawamus Chief and Shannon Falls. There are 19 cars, each able to transport eight passengers up Mount Habrich. 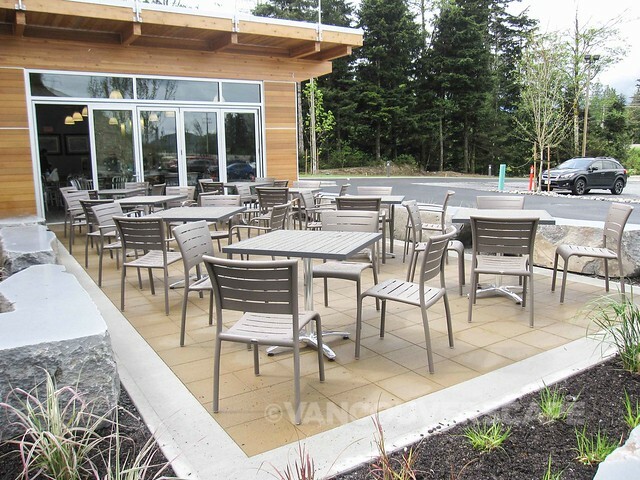 The focal point of the entire facility is a 9,000-foot lodge with a restaurant, gift shop, restrooms, and viewing platforms. 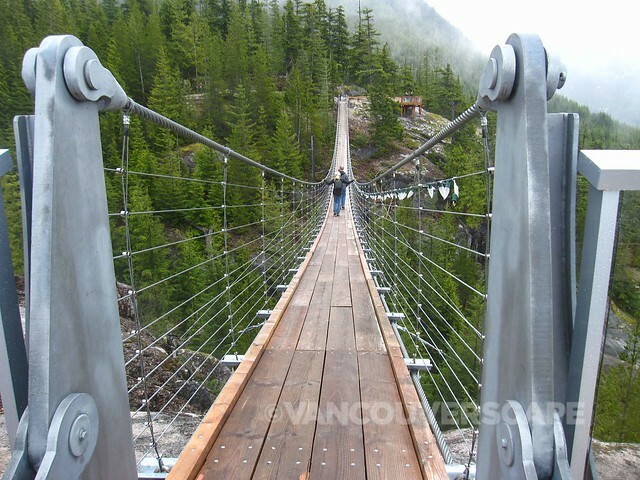 This is also the starting point for the suspension bridge that leads to several walking trails. All three peaks – Ledge Mountain, Sky Pilot (the highest), and Co Pilot – are considered mountaineering peaks, and are meant to be approached by expert climbers only. 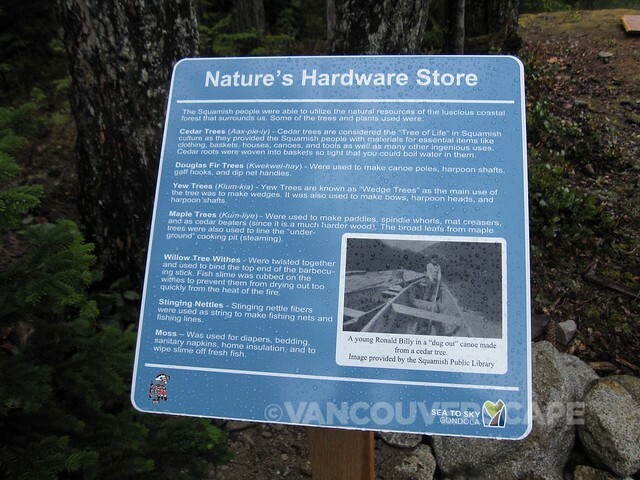 Your basic introduction to the trails begins with 400-meter looped Spirit Trail, with signage posted along the way pointing out some of the flora and fauna that can be enjoyed here. Red cedar, Hemlock, Douglas Fir, and White pine are typical foliage you’ll encounter. Feathered friends the Varied Thrush, Robin, Ruffed Grouse, and Bald eagle are home here. In fact, our guide Stephane mentioned that eagles use The Chief to soar and gain altitude, before heading on to Fraser Valley’s Lake Harrison (known as the world’s most populated winter eagle-viewing area). 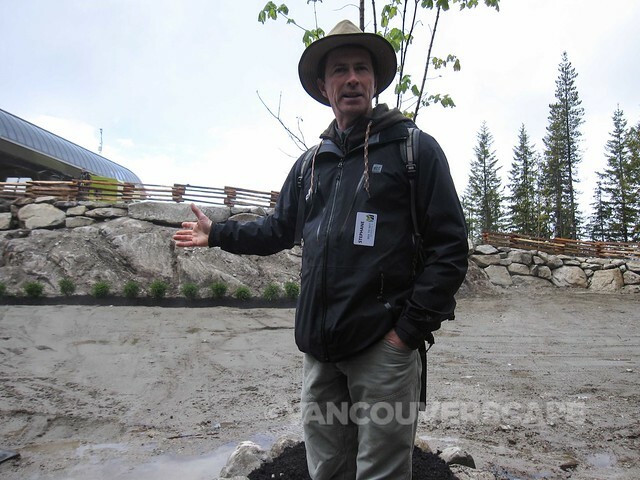 The facility will offer year-round adventures, including hiking, trail running, rock climbing, mountaineering, ski touring, and snowshoeing (an ice skating rink is in the works). 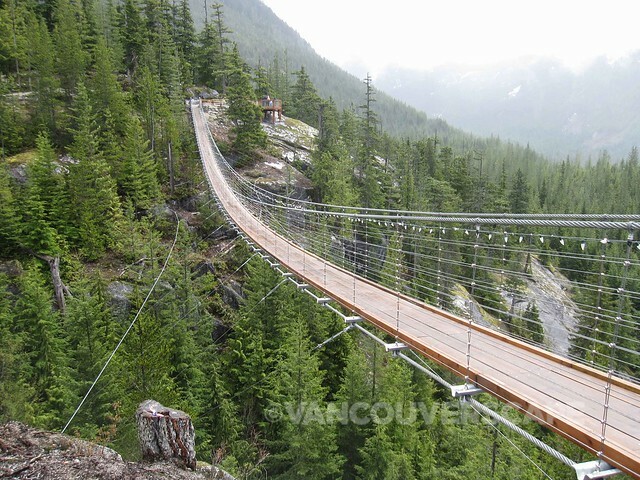 Clocking in at 100 meters, the Sky Pilot Suspension Bridge is a shorter traverse than its somewhat nearby cousin, the Capilano Suspension Bridge, but the scenery is nothing short of spectacular. 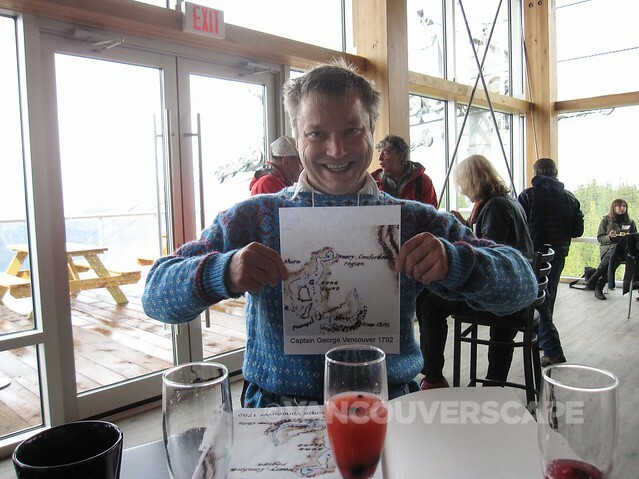 During our lunch inside the lodge, I met with local tour operator/Squamish area historian Eric Andersen, who explained that Squamish’s tourist industry dates back to the late 1880’s, after the Canadian Pacific Railway was completed out west. 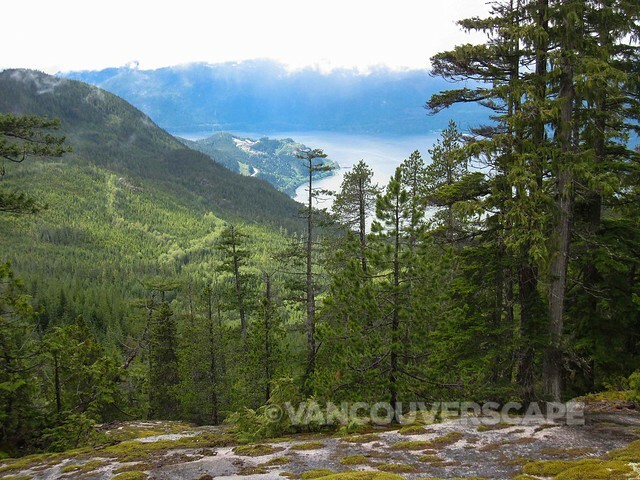 Captain Vancouver sailed these parts, proclaiming it “a dreary, comfortless region” in 1792. Don’t believe me? Check out a reproduction of the map being held here by Eric. Likely the day was filled with rain clouds. Still, this was the only regional map in existence until the Gold Rush. 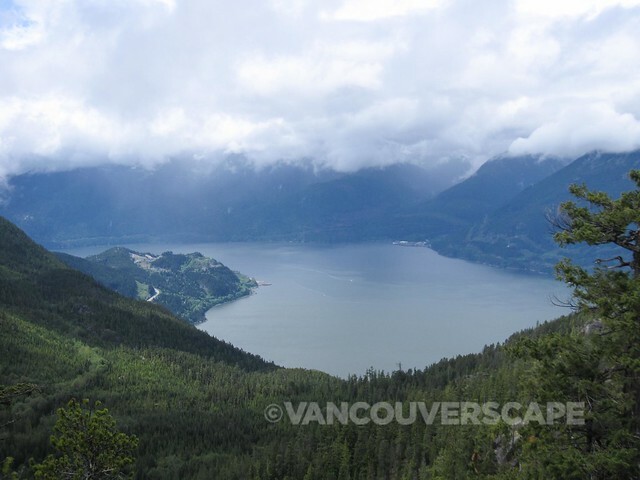 The area is an ancient trade and travel corridor, used by the Interior Salish people. The Chief is called Sta-mus, translating to “shelter” in the Salish language. The people below the Chief were thus sheltered from the elements. Believe it or not, 10,000 years ago, the Chief (aka the world’s second largest monolith, after Ayers Rock) was once an enormous piece of WHITE granite. 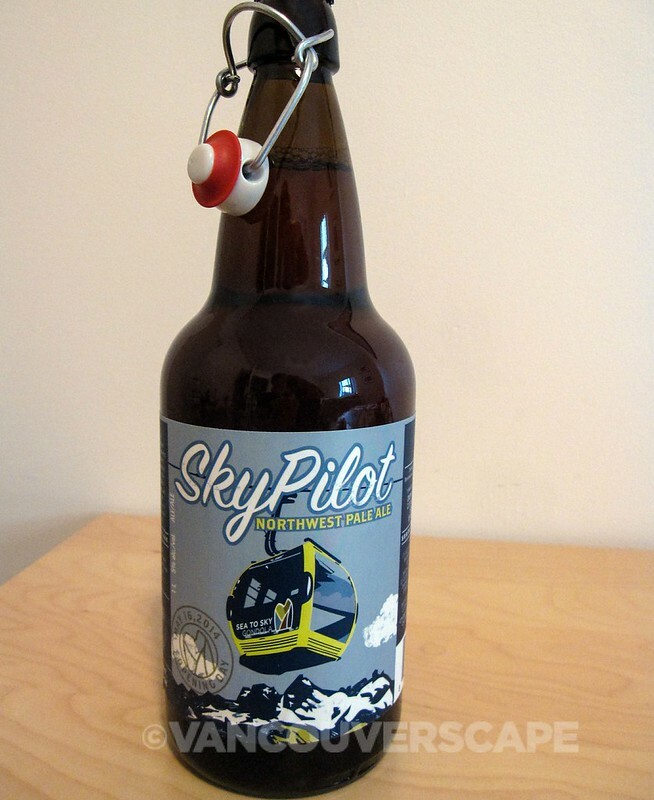 Craft beer fans will be happy to know that Howe Sound’s created an official Sky Pilot Northwest Pale Ale brew, its bottle sporting a Sea to Sky Gondola car and the official opening day seal. 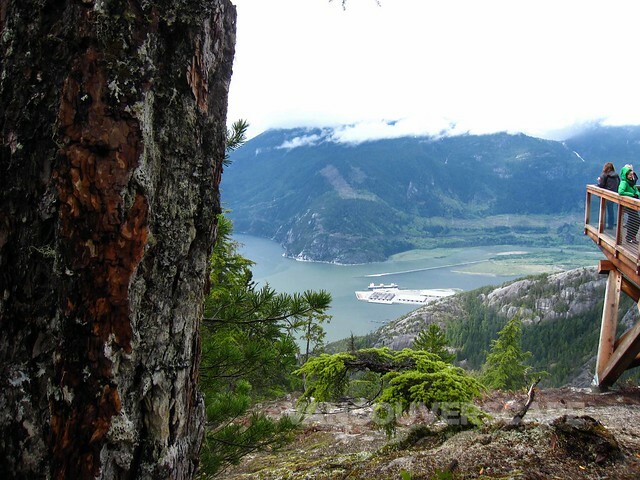 Imagine a summer day hike followed by a cool sip of ale, admiring the view of Sky Pilot Peak, all in BC’s own backyard. 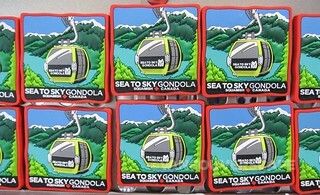 Sea to Sky Gondola tickets are priced at $34.95 (adults over 19), $32.95 (seniors 65+), $22.95 (children 13 to 18), and $13.95 (children six to 12). Children under six are free; family packs ($89.95) are good for two adults, two children. Adult summer season passes are $99.00. If you’re keen on hiking UP (a hike recommended for intermediate-to-advanced level walkers), a download ticket costs $9.95. 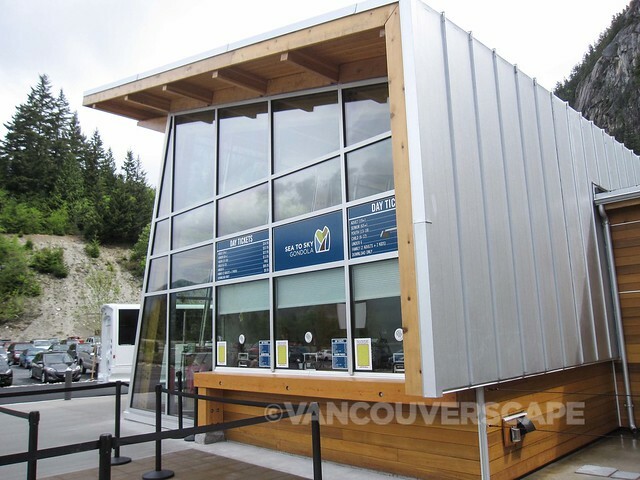 We wound down our trip with a brief visit to Squamish Adventure Centre, housed in a gorgeous wood and glass structure containing a wealth of maps, informational videos on demand, and some of the tastiest gelato in the area! 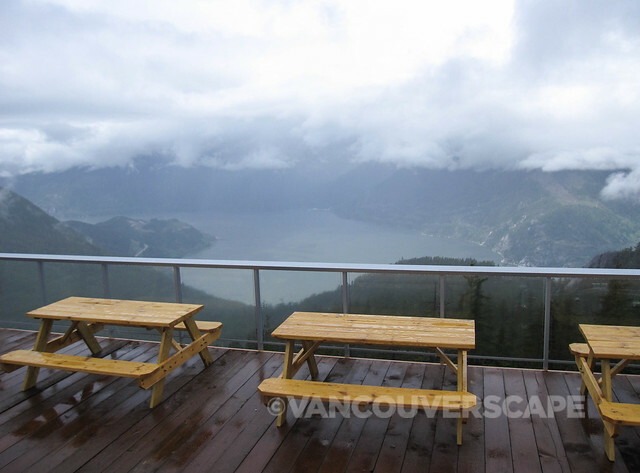 A huge thanks to Landsea Tours for giving us such a unique – and complete – experience of Howe Sound and Squamish.